Reading the map – East or West? 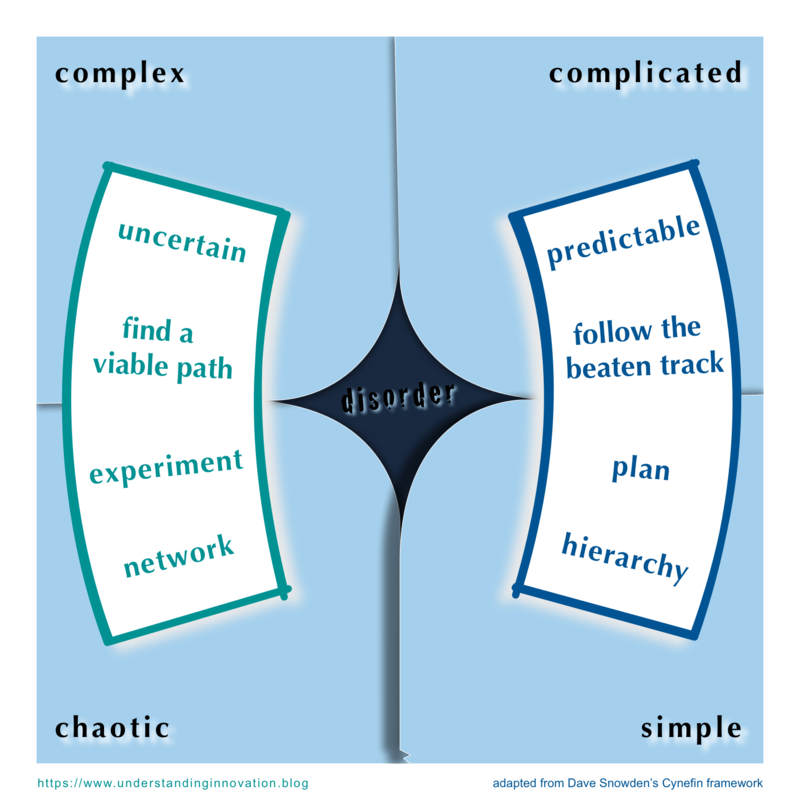 With the Cynefin framework, Dave Snowden developed a sense-making model that can serve as a map to give you some orientation in challenging situations of decision-making or problem-solving. Over the past few weeks, I gave a basic introduction to the framework’s five domains of simple, complicated, complex, chaotic, and disorder, and offered a set of examples. The most recent post took a closer look at how you could read this map and why it is prudent to avoid the South (i.e., the simple and the chaotic domain). Today, I’ll investigate the main differences between the Eastern and the Western domains of the Cynefin framework and how those will affect your chances of success. In the following confrontation, I’ll use the term ‘the East‘ to denote the simple and complicated domains; and I’ll say ‘the West‘ when I talk about the complex and chaotic domains. Throughout this comparison, I’ll systematically begin with the East, as that is ‘closer to home’ and ‘more comfortable’ for most of us. All differences between the East and the West derive from their basic characteristics. While the East is predictable, the West is uncertain. This seemingly marginal distinction means much more than just splitting philosophical hairs, for it fundamentally defines the nature of the situations and problems in either the East or the West. And what is more, this difference affects your means for dealing with those situations and problems, and even your very perception of them. These basic characteristics dictate your general approach. In the East, where the underlying causalities between your actions and their consequences are well-understood and thus the basic rules for handling your affairs are well-established, you can follow the beaten track in already known terrain. In the West however, where causalities are either unknown or non-existing, and where rules are at best slowly emerging, you need to find a viable path in previously uncharted territory. And you are well advised to organise your affairs according to these circumstances. In the predictability of the East, you can plan your next steps and then execute your plan. And you can structure your organisation as a more or less rigid hierarchy. While this will cost some resources to establish, it will be highly efficient in executing your plan. Under such predictable circumstances, you know upfront what the right things to do are. Hence you can devote your attention to ‘doing things right‘: the East asks for basic management skills. Yet in the uncertainty of the West, you need to experiment in order to figure out what works and what doesn’t. Experiments, successful and failed, are your means to find your way forward, one step at a time. Corresponding to this emergent path, you will give your organisation the elastic structure of a network. This can be ambiguous and inefficient, but it will remain adaptable and inherently resilient. Under these uncertain conditions, you must focus your attention on finding and then ‘doing the right things‘: the West clearly demands leadership skills. Those fundamental differences between the East and the West do not only apply to situations of decision-making or problem-solving. They also affect your perspective of such situations, and your beliefs about decision-making and problem-solving in general. And depending on whether you made your experience in the East or in the West, your perspectives will be vastly different. In fact, Eastern and Western perspectives couldn’t be further apart. Here are a few examples. In the East, you’ll have an initial idea (or even a set of ideas) of what your situation or problem is like and how you will handle it. Such ideas are based on past experience; they serve as your models for future situations. You work under the assumption of familiarity: any new situation or problem will be largely familiar to you already. All you have to do when facing a new problem is to find similarities: (1) look for the data the new situation gives you; (2) match those data to the models you have; (3) identify the best-fit model; and (4) execute next steps as prescribed in that model. What is more, these models deliver fairly good representations of Eastern situations and problems: they do not require many specific assumptions or difficult abstractions. Instead you might say that these models stay fairly concrete and tangible, as simple situations and simple models go hand in hand. Therefore, the experience in the East promotes the belief that models are the tool for handling your affairs. In the West, however, you won’t have the benefit and comfort of such an initial idea. And you should not assume familiarity either. Instead, you’ll have to develop your own understanding of that new problem. From scratch. In order to solve that problem, you’ll have to improvise and experiment: (1) probe the problem, see how it reacts, probe it some more, and collect more data; (2) identify a pattern in those reactions, and derive your initial model; (3) devise a solution based on that model; (4) implement the first step toward the solution; (5) check the problem’s reaction to see if your model still holds; (6a) if yes, implement next step; (6b) if no, adapt your model as necessary. With this iterative approach you will develop your model on the fly, and in parallel to actually solving the problem. Such models easily become highly abstract as they must simplify a complex reality; through this reduction, the models are necessarily incomplete and might even be overly simplified. Hence they can be misleading. Taking into account the significant effort required for developing such models, and considering their ephemeral nature, experience in the West let’s you view models as a tool for handling your affairs. In the East, learning is the acquisition of pre-existing knowledge and insights. That knowledge is obviously new to you, but not to humankind. So all you’ll have to do is read the book or find the expert. The role of the learner is rather passive, limited to finding the right source and then absorbing what is available. In the West, you will face situations and problems with little or even no available knowledge. Hence you are forced to develop your own understanding. Learning under these circumstances means that you will become the expert and/or write the book. As a learner, you play the highly active and creative role of a generator of novel knowledge. In the orderly world of the East, the future is a repetition of the past. That’s like navigating the road ahead by staring at the rear-view mirror: works very well as long as there’s little traffic and no turns. The corresponding sense of time is cyclical; very natural, like day-time or the seasons. Change is accepted as natural variation within the cyclical patterns, but any other change presents an external threat to the established order. The underlying mindset is rather static and seeks to minimize risk. In the fuzzier world of the West, the future is yet undefined. The future is ahead and uncharted; and most importantly, the future can be shaped. The corresponding sense of time is linear; the past is only the origin of time, but it does not predetermine the future. Seen this way, change is a natural thing to occur, and change is inherently neutral. According to this more dynamic mindset and its focus on the opportunities embedded in uncertainty, the future is what you make it. The experiences you gained on one side, and your corresponding expectations of what works and what doesn’t, those experiences and expectations will not match the reality on the other side. Experiences cannot be transferred to, and expectations should not be imposed on the respective other side. Success in the East does not guarantee success in the West, and vice versa. Instead, the critical skill is adaptability: your ability to match your approach to the type of challenge you face; rather than insisting that your previous experience will automatically be applicable. As if all of this wasn’t difficult enough, there are three different layers ‘you’: individual preference, leadership style, and organisational culture. They are interconnected and interdependent, and the quality of their interactions can be anywhere in a range from mutual paralysis to mutual reinforcement. Individual preference – It’s no secret that everybody has individual preferences, based on personal skills and experiences. And that’s true for decision-making and problem-solving as well: everybody favours some method or approach, everybody has a comfort zone. But few are willing to leave their comfort zone and try out other approaches. Even fewer are ready to adjust the approach they choose to the problem they need to solve. And only very few people are highly adaptable, i.e., entirely comfortable with frequent adjustments of the approach they take, and equipped with a large ‘toolbox’ that they are able to employ. Leadership style – Of course leaders are individuals, hence they have their preferences just like everybody else. But leaders are also multipliers: they shape their organisations. Based on their personal preferences and skills, they encourage behaviours, select staff, define processes and structures, decide on products and services, devise strategies and policies. In short, leaders decide on the allocation of resources. Not only money, material, and people, but more importantly attention and time. They do not only prioritise efforts (which decision to make first, which problem to solve next), their personal preferences also shape their teams’ approaches: rigid leaders will implement clear hierarchies, while adaptable leaders will prefer flexible networks. Organisational culture – The culture of an organisation is difficult to grasp, but you cannot afford to ignore it. For on a good day, it’s just a nice backdrop for your endeavours; but on a bad day, it’s the elephant in the room. Established structures and processes, current staff with their experience and skills, today’s portfolio of products and services, as well as facilities and infrastructures, they all represent significant past investments that define what the organisation can and cannot do in the near future. You might call that an organisation’s inertia, and that’s often considerable. Organisational culture extends far beyond the immediate influence of leaders, it works in the long run as it shapes –and reflects– the organisation’s traditions and values. Most of the time it’s hidden below the surface, but it’s always a potential obstacle if you seek change. And that’s the reason why culture eats strategy for breakfast: a strategy is just a plan for successful change, whereas an organisation’s culture defines its actual capacity for change. This type of discussion is not new, but it becomes delusional when lead in abstract generality and focused on theoretical rights and wrongs. The real question is about the most appropriate approach in a specific concrete context, it’s essentially about matching your approach to your current challenge. Individual, leadership, and organisational comfort zones could only be successful if problems were willing to fit into such moulds. And you’d better think twice about the level of “co-operation” you can realistically expect. No, the key to your success is your adaptability; it’s your willingness and ability to adjust your approach to the type of problem you face; it’s your willingness to leave your comfort zone and your ability to break your own mould. There is no one-size-fits-all solution, every problem forces you to tailor your approach to fit its characteristics. This is not a question of picking the right side; there simply is no right or wrong side. Both, the East and the West, is sometimes right and sometimes wrong. Hence your challenge is to keep one foot on either side and then shift your balance as and when needed. And that cannot be a static equilibrium; you will need to adjust that balance time and time again in order to adapt to ever-changing circumstances, thus to respond to the characteristics of your problems. Given the almost irreconcilable characteristics of Eastern and Western type problems, the constant search for the best balance might seem daunting, an impossible mission. In the next post, I’ll argue for embracing what seems paradoxical, and offer some ideas on the organisational shapes, leadership styles, and organisational cultures that could support you in that endeavour. « Reading the map – Keep to the North!